Happy New Year everyone! I hope you are having a great start to 2016. I have many awesome recipes lined up for the beginning of this year, all of which have already become a staple in our house, and I can’t WAIT to share them with you. I am starting off with one of my favorites, Sun-Dried Tomato, Miso, and Basil Pesto! Pesto has always been a staple in my house for years. You’ll always find a few tubs of it in my freezer. I find it to be the perfect freezable ingredient and easy to pull out for various quick meals like sandwiches, pasta, pizza, salads, etc. Plus if you are making some anyway, why not buy a bunch of basil and make a HUGE batch of it all at once?! Then, you can freeze the leftovers in freezable containers and use as needed. Also, it’s one of those ingredients that store-bought jars just don’t cut it, at least not for me. I find them full of oil and lacking flavor. Now that you know how much I utilize pesto, let me tell you how this particular recipe has become my favorite. Don’t get me wrong, I love the traditional recipe with simply basil, pine-nuts, olive oil, salt, and pepper, but after becoming vegan and omitting the Parmesan cheese, I was trying to come up with another formulation that tasted the same, if not better. There are a lot of recipes out there for vegan Parmesan and also vegan pesto using different combinations of nuts, nutritional yeast, etc. However, quite honestly, I’m not a fan of any of them, especially in a pesto recipe. Instead I prefer to omit the “cheese” component all-together and add a little extra salt. So I started playing around with combinations of ingredients until I arrived at this recipe. 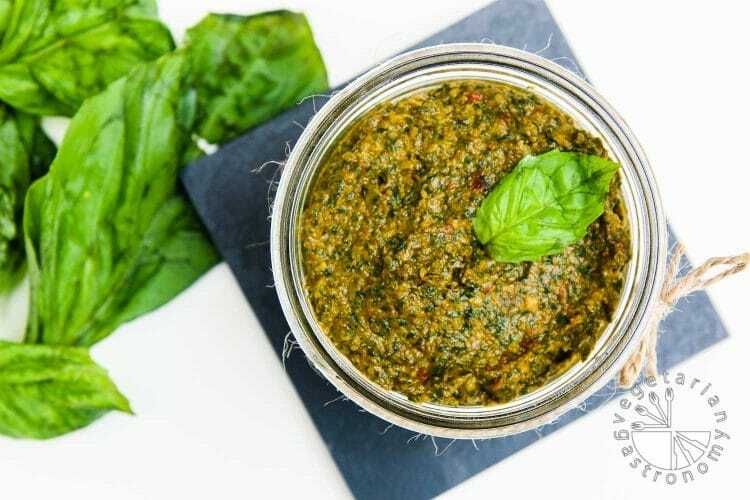 The flavor of this Sun-Dried Tomato, Miso, & Basil pesto is rich, full, and complex. Simply put…it’s SO good! 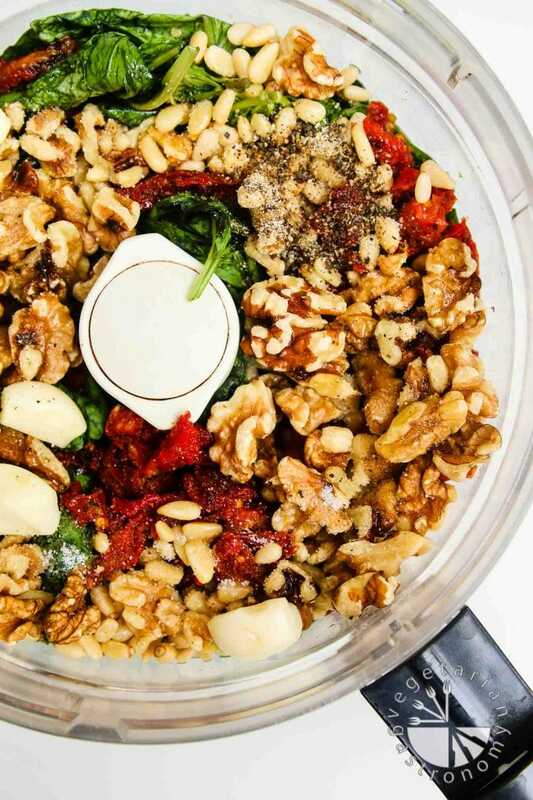 Fresh basil, garlic, sun-dried tomato, a few different nuts, and Miso did the trick. The walnuts added a slight element of sweetness while the Miso added that perfect umami flavor I was trying to find. 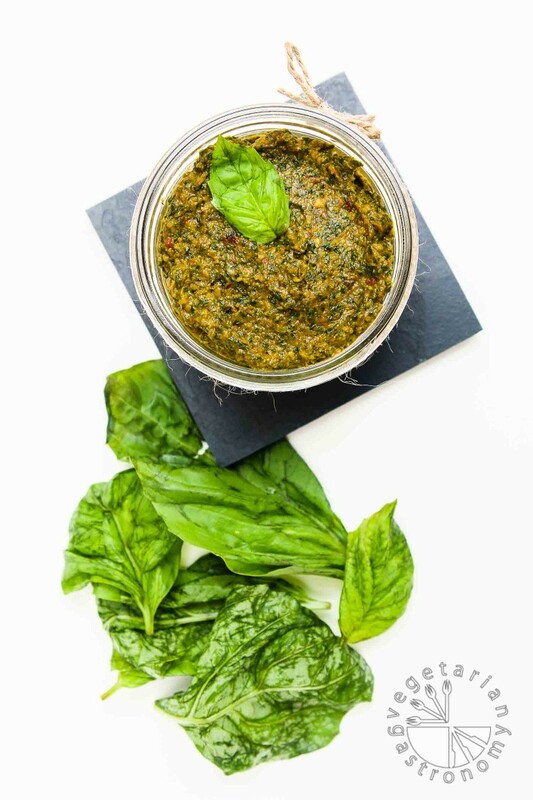 This combination of ingredients will have you adding pesto to everything, and that’s exactly what I’ve been doing lately. I can even say that it’s so much better than any cheese-version of pesto and my husband easily agrees! I have a few great recipes coming up using this Pesto, but until then, grab the ingredients, make a HUGE batch of this Pesto, use it on anything and everything, and freeze the leftovers. Trust me, when you see my recipes coming up, you’ll wish you had some of this pesto ready to defrost. Miso is the key ingredient in this pesto recipe, making it "cheesy" and flavorful without all the dairy! Add all the ingredients to a food processor . Add more or less oil depending on desired consistency. Store in the fridge for 2-3 days or for longer in the freezer in a freezable deli container . Sun-dried tomatoes - I use the ones that come in a jar. If so, be sure to drain out the sun-dried tomatoes in a strainer as best as possible, then measure and add in with the rest of the ingredients. Each serving size below is 1/2 cup prepared pesto. « Best of 2015 – Top 10 Recipe Posts On Vegetarian Gastronomy! Thanks Mandy! 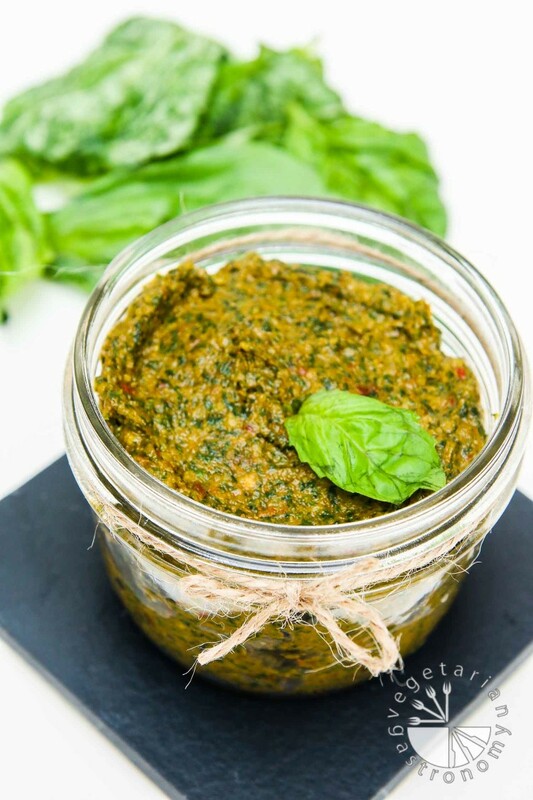 You will love this version of pesto...it's my favorite one yet! The flavor of miso tastes great with all the other ingredients. I have a few fun recipes coming soon! Thanks Reshana! Have you had miso before? It goes perfectly in this pesto! I always use pesto in other dishes and bread that I've honestly never had it with crackers! Will have to try! 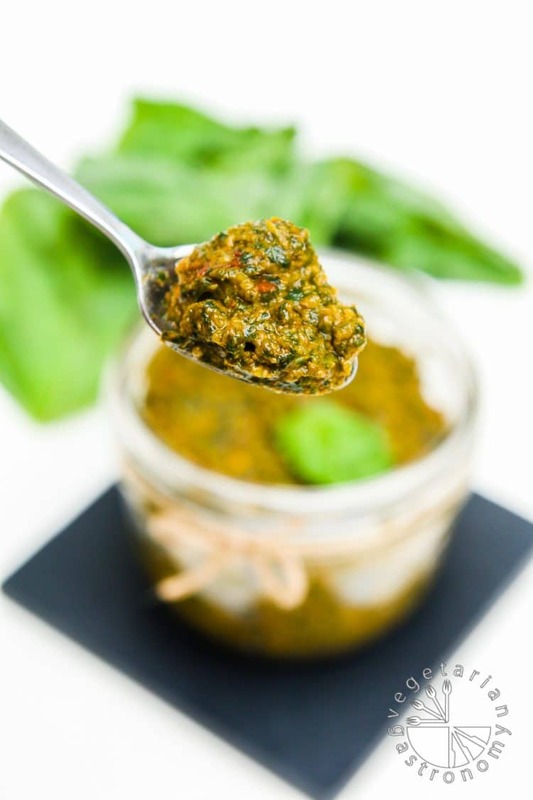 This recipe for pesto is definitely a winner...it's so good with the Miso! Awww that's a bummer...Miso is so awesome for many things! Thank you Aria! Glad you guys loved it, it's one of my favorite pestos and I have a bunch of recipes coming out that use it. Appreciate the feedback! I Have made this twice and used it in a few dishes. Most recently I added it to ricotta cheese layer of a roasted veggie lasagna I made.It was the best lasagna I've ever made. This pesto really kicks things up a notch. This comment made my day because it's one of my favorite recipes! Thank you Bill...your lasagna sounds awesome. This pesto has so many flavor profiles that it's really all you need and it freezes well. Thanks again for trying out my recipe! This pesto came to my rescue again. I am making a fettuccine Alfredo that uses cauliflower as a base for the sauce. It was turning out ok but I felt it was lacking something. A few spoons of pesto and it's worth serving to my girl. Hi Bill!! That's awesome!! I've tried a few cauliflower based alfredo sauces before and have felt the same way (I'm actually in the middle of testing out my own plant-based alfredo sauce! )...but what a great idea! Adding a little of the pesto would totally fix that lack of flavor issue! Especially with this pesto since it's so flavorful. Thanks SO much for trying out my recipes!! Not sure if you're into it, but have you checked out my walnut sun-dried tomato crumble recipe? I feel like you'd love it if it's your thing. Thanks again! Definitely looks like my thing, I will add it to my list of weekend cooking. along with another batch of pesto for the Mediterranean Spaghetti Squash that i'm making for my parents this weekend.keep the yum coming! That's great to hear! Awesome...so glad you're loving the pesto! Thank you!! I made this tonight -- very tasty! Thanks for the recipe! Thanks Nicki!! I saw you used it on the pasta...so delicious! You have me craving this again! Just finished making this and I can't stop eating by the spoonful right from the food processor - SO GOOD. I did make it with arugula, as basil only came in a very small bunch and was $$$. Also I used roasted, salted sunflower seeds instead of pine nuts. Great recipe! That's so awesome!!! 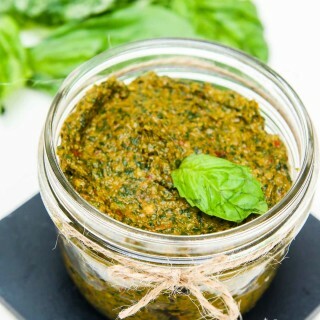 Good pesto is meant to be eaten by the spoonful ha! I have another few great recipes coming soon using pesto! Your arugula, sunflower seed combo sounds great, nice to know another green worked out! Thank you! Never had miso in pesto before!